Oliver Laas writes about the first exhibition "Demodictus" by the art group Demodictus (Ott Pilipenko, Mari Prekup, James Connor, Priidik Hallas, Taavi Tulev, Märt Vaidla). To form a concept for their exhibition, Demodictus starts from the position of cultural and linguistic relativity and within that pluralist framework, tries to find a more or less constant notion or phenomenon that could be shared by different cultures. This constant is found in death – dance macabre to be more precise. The visitor is invited to playfully engage with the notion of death. So, the two prevailing themes of the exhibition are play and death. In Estonian, there is only one word to mark the concepts of play and game – mäng. It is used both for chess and improvisation. However, these two types of activities should be terminologically distinguished from one another. To do so, I use Roger Caillois’ terms paidia and ludus. The former refers to improvisation and the surrounding free flow of fantasy, and the latter marks a game that is subjected to arbitrary and imperative rules.1 In the press announcement for the exhibition, the word "mäng" is used in the sense of paidia – the terminology and contexts are subject to improvisation – when it comes to the works themselves, they mostly fall into the category of ludus because many of the installations have been presented in the form of a game and come with clear instructions. Most people want their life to be meaningful. Cultures share many strategies to evoke meaning in life and to overcome the fear of death. One of those strategies is religion. Many religions overcome the fear of death and give life meaning through a concept of life after death, which denies the finality of death: death is a transition phase where life continues in one form or another. 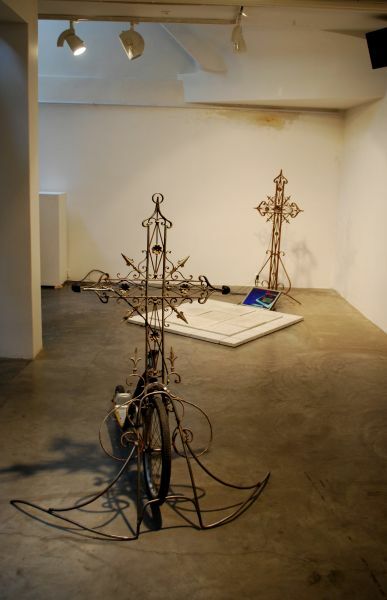 One of the motifs of the exhibition is the cross – an old symbol, common in many religions. The artists say that besides religion, the cross should refer to the Western world in general. In most of the works, the cross does not point to religion or even to the Western world ("Aabraham tellib munavahu" (Abraham Orders Whipped Egg) (2012), "Objekt nr 2 – portatiivne hauaplats" (Object No. 2 – Portable Burial Place) (2012), "Objekt nr 4 – Notke 360º" (2012), "Objekt nr 1 – Dance Dance Macabre" (2012)) but to death, as this particular aspect of its semantic field overshadows all else. Even "Objekt nr 3 – Jane Fondale" (Object No. 3 – For Jane Fonda) (2012), which at first seems to tackle the issues of the Middle East and the West, is in my opinion actually concerned with the cult of the body, which is one of the manifestations of the fear of death in the predominantly secularized Occident. For me, the message of the exhibition reveals itself in works such as "Dance Dance Macabre" and "Notke 360º". The latter is a wheel of fortune that depicts the dance macabre as the different social groups of today. The dance of death reminds the spectator of the perishing and superficial nature of material possessions. At the same time, it also carries an egalitarian message: death does not care about differences in class, profession or financial position. According to Johan Huizinga, these visions have their origins in self-interest and are concerned with this world; it is not about grieving the dead but the fear of death.3 In gambling, chance has the dominant position and winning is decided by fate. The player is passive and can only rely on fate and luck. At the heart of the competition is the question of who is favoured by luck the most.4 Demodictus’ wheel of fortune – or would the term wheel of death be more accurate – eases our fear of dying by allowing us to apparently beat death in the game. Different sectors of the wheel of fortune are usually designated with prizes of varying value. The sectors on the wheel of death, however, are all equal: all the classes, nationalities and age groups depicted ultimately die. Every player only belongs to some of the groups. As the player spins the wheel, they try their luck against death. The player wins when the scythe of death points to a group that the player is not a member of. The only prize in the game is the life of the player. Being favoured by luck means instead of me others will die. "Dance Dance Macabre" where the visitor can dance with skeletons, is inspired by dance and rhythm games, mostly by Dance Dance Revolution (1998). In novels and in films, time is usually linear and uni-directional. That is why non-reoccurring life-events such as birth and death acquire great meaning in the light of the great narrative. (This applies to more traditional narratives. Postmodernist literature is an exception here.) In play, time is more cyclical and repetitive. Death becomes insignificant and meaningless as its consequences are not permanent. Death is rather a temporary pause or punishment that motivates the player to improve their skills. Therefore, death (or loss) teaches the player to overcome death (loss). The same applies to this work. So, here we can see another way of overcoming the fear of death: death is incorporated into the notion of time in games, and hence, deprived of its irreversibility and finality. Instead, it is turned into one of the mechanisms of adaptation among many others. To conclude, it seems to me that paidia with death was not very clearly pronounced in the exhibition. Firstly, only a few works try to place the symbols associated with death into other contexts. Secondly, the context of the exhibition for most of the audience is Western culture, which does not allow for the necessary contextual shifts. Nevertheless, ludus with death offers a strategy for overcoming the fear of death that is often overlooked – to make death part of the game. La Rochefoucauld has written that one can look neither at the sun nor death without blinking an eye.5 Demodictus shows the viewer that play is one of the ways of overcoming the fear of death, and they face death while blinking their eyes. Oliver Laas is a PhD student in the Department of Philosophy at the Estonian Institute of Humanities, Tallinn University. 1 Roger Caillois, The Classification of Games – Man, Play and Games, translation by Meyer Barash. Urbana, Chicago: University of Chicago Press,  2001, p 13. 2 Todd May, Our Dealings With Death. – Death. Durham: Acumen, 2009, p 4, 5, 6, 9–11, 22, 25–26, 29, 32–34, 35–36, 40; Martin Heidegger, The Possible Being-a-Whole of Da-sein and Being-toward-Death. – Being and Time: A Translation of Sein und Zeit, translation by Joan Sambaugh. New York: State University of New York Press,  1996, pp 219–246; Jean-Paul Sartre, My Death. – Being and Nothingness: A Phenomenological Essay on Ontology, translation by Hazel E. Barnes. New York: Washington Square Press,  1993, pp 531–553. 3 See: Johan Huizinga, The Vision of Death. – The Waning of the Middle Ages: A Study of Forms of Life, Thought, and Art in France and the Netherlands in the Dawn of the Renaissance. English translation by Fritz Hopman, London, 1924. 4 Caillois, op. cit., p 13, 17–18. 5 François de La Rochefoucauld – Reflections; or Sentences and Moral Maxims, tlk John William Willis Bund ja James Hain Friswell. London: Simpson Low, Son, and Marston, [1678, 1827] 1871, maxim 26, p 24.